Steve Hutchinson has been working on the restoration and repair of classic boats for over 25 years. In 2000 Hutchinson Marine Service was launched with the vision of providing the highest quality repair and restoration to the boating community. As skilled experienced craftspeople, we find solutions that are creative and effective, and aim to keep the costs of maintenance as manageable as possible. Services include structural assessment and repair, teak deck building and installation, plumbing and electrical wiring, painting, varnishing and more. Our traditional approach combined with expertise in the most innovative, modern technologies ensures your classics of any era is in good hands. The strategies we offer are based on honesty and the best interests of you and your boat. We look forward to working with you to help maximize your long-term use and enjoyment of your boat. 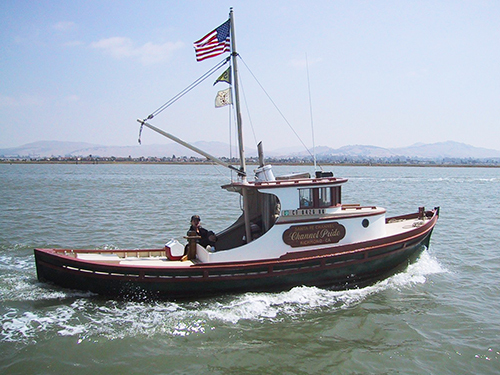 When not working on his clients classic boats, Steve can be found on his own classic, Channel Pride, a 1943 Monterey Fishing Boat.